The parable of the Prodigal Son is one of the best known stories in all of human literature. It could be called the parable of the two sons, the elder and the younger. But the real hero of the parable is not one of the sons, but the father. 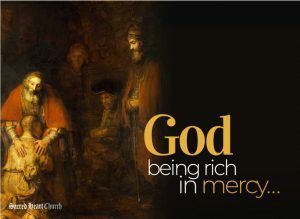 Jesus is giving us a portrait of God, who always takes the first step to bring us back into his friendship, no matter how far we may have strayed…this is the Parable of the Merciful Father…He is rich in mercy. Lent and Advent are wonderful liturgical seasons to start family faith traditions. It’s never too late to start meaningful celebrations your family will relish in posterity. Read together the daily gospel mass reading before the family dinner, have a family fish fry Friday before joining the 7 PM Stations of the Cross, and dedicate a Saturday this Lent to go together as a family for the sacrament of Confession. A family that prays together…stays together! Start your household Lenten traditions today!